The iPhone 5 was hammered by critics when it emerged onto the market. However, it was lapped up by consumers, many of whom had pre-ordered their next iteration of the iPhone series. The iPhone brand is a funny phenomenon. It started off the smartphone industry as we know it and has been leading innovation in many ways. However, between the iPhone 4S and the iPhone 5, there was a disappointing lack of innovation and progress. Consumers that love Apple are still enamoured with the brand. However, many on the periphery and many industry pundits see things falling away. Shares have fallen and the demise of Steve Jobs really seems to have had an impact on the brand. He was the driving force behind the success of Apple, even from the iPod and through the iPad and into iPhones. What will come of the brand? Only time will tell. Samsung on the other hand have had an amazing time. 2012 was their best year yet, seeing them take over the mantle of the number 1 phone company in the world from Nokia. Nokia had held the mantle for 14 years in a row prior to that… so what an achievement by Samsung. They also topped the smartphone sales list ahead even of Apple. Samsung enter into many different levels in the market, from budget through midrange and into premium range phones, and this could well be part of the root cause of their success. So without further ado, let’s have a look at how these two phones stack up against each other. Granted the iPhone 5 is a little bit older now, and you can get some really good iPhone deals on it. The Samsung Galaxy S4 is newly released and you don’t get the same number of deals as you do iPhone deals. The display on the Samsung Galaxy S4 is 441 ppi compared to 326 ppi on the iPhone. The iPhone screen is phenomenal. It is a Retina display. However, the Samsung Galaxy S4 super AMOLED full HD screen is even better. It is a 5-inch display instead of a 4-inch display, and it is frankly the best out there. The dimensions of the phones are very different too. The iPhone is skinnier and smaller and the Samsung Galaxy S4 is a little bit heavier too. Ergonomically, both of them are very good. They feel premium in the hand and have a stylish quality about them that you’ll only find in the top premium phones. With the iPhone 5, you get a dual core 1.3GHz processor. With the Samsung Galaxy S4, you get a much more powerful 1.9 quad core. The Samsung Galaxy S4 for me is faster, better, and stronger, it’s just a more powerful beast of a phone; better for multitasking and most things you’d want to do. Every app that is developed for the iPhone store is developed with the iPhones in mind. Therefore, you shouldn’t find applications that are too heavy for the handset. Indeed, the iPhone 4S is of similar power to the iPhone 5 in reality even though it has an inferior processor. The 4s has a dual core 800MHz as opposed to the 1.3GHz dual core on the 5. Both phones are zippy and snappy and very similar in performance terms. When you measure an iPhone in terms of classifications against another phone, it comes down to not just the numbers but the performance. And the iPhone 5 does extremely well to give every user a rounded and excellent experience. For Samsung the Galaxy S4 is a feat of engineering. It isn’t just a manufactured phone. It is a powerful beast that improves in every way on the Samsung Galaxy S3. Its 13 megapixel camera is probably the best phone camera in the industry. It comes with additional storage capacity in a micro SD card slot where the iPhone does not. It trumps the iPhone in just so many ways. You can get some really good iPhone deals on the market, and you can get the iPhone cheaper than the Samsung Galaxy S4. If you look on e-Bay, you can get the S4 for about £500 and the iPhone 5 for around £470. The difference though in cost between the phones is much wider than the price differential. 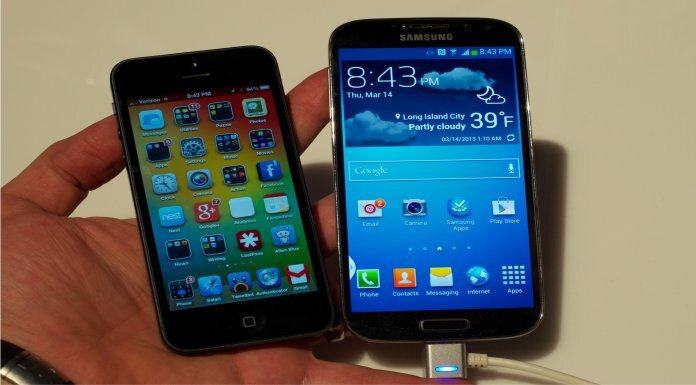 You really should be looking at the Samsung Galaxy S4 and not the iPhone 5 if you’re looking at a straight comparison. However, if you are a loyal Apple brand consumer, you’ll find in the iPhone 5 a really good phone that you can enjoy a great deal. We’re likely to see some new iPhones emerge over the coming months so be careful before you commit to a 24-month contract with an iPhone 5. The iPhone 5S or the iPhone 6 will be here (probably) sometime in the next two months. There are reports that it will have a 4.7-inch display and then it will be a quad core phone. Much of what we know at the moment is really just speculation, and there’s lots of other speculation too. For example, we may see a 5.5-inch Apple iPhone with a mega sized screen. We may also see a budget phone that in reality will be a mid range phone of probably around £300. Apple, it looks like, are going to diversify into more phones in order to compete with Samsung on the others in different areas of the market. Time will tell whether they are successful or whether they actually damage their brand by diluting their premium quality ethos. When you’re looking for iPhone deals and Samsung Galaxy 4 deals, make sure that you get the right data allowance for you. When you have a superb display like on the Samsung Galaxy S4, and to a lesser extent the iPhone 5, you will no doubt spend more time browsing the web and downloading apps. You’ll also take a lot of pictures and end up with those on social media. Your internet data may well be the first to go each month if you don’t get enough allowance, especially with 4G arriving around the country. The fourth generation of mobile broadband will speed everything up and make you want to do more things that consume internet data. A 500MB allowance per month may well not be enough and you can get packages with up to 20GB of data. These may well set you back about £75, as with Everything Everywhere, but it may well be worth it and save you a fortune in additional charges if you end up having a few heavy days of internet consumption. You also don’t want to be left without internet when you want it most, so do ensure that you assess your consumption needs before you jump into a contract.